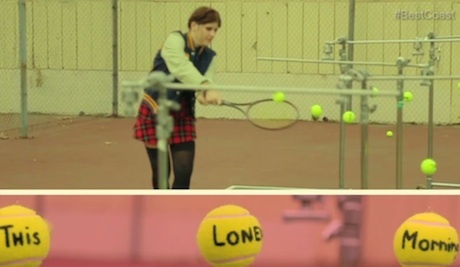 Today, California pop team Best Coast have shared a video for a new song from their recent Fade Away mini-album. Though it's billed as a "lyric video," the clip is much more, as it features the band's Bethany Cosentino and Bobb Bruno prominently. The two ham it up for the camera on a tennis court, hitting tennis balls that happen to have the lyrics written on them. Check out the lyric video for "This Lonely Morning" below courtesy of Funny or Die.